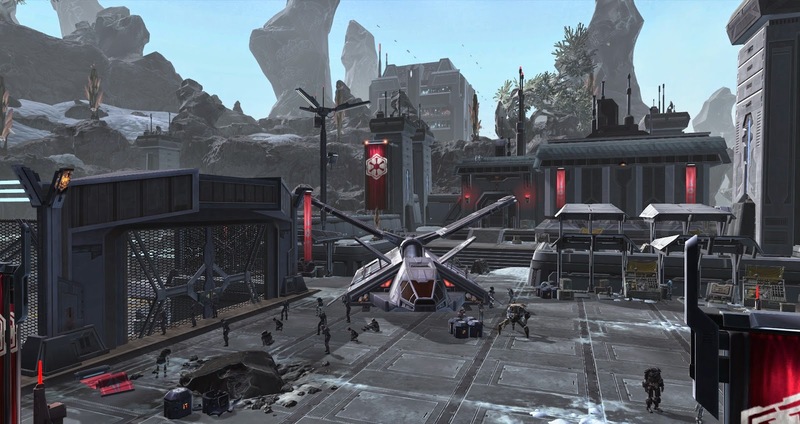 My first impression of Ziost upon landing was that it looked a bit like an Imperial Ord Mantell with snow, what with the town where you land being surrounded by rock formations. This was not a bad thing, as I always tend to think fondly of my newbie days on good old Ord Mantell. Other than that, the quests on Ziost were pretty straightforward from a mechanical point of view. It was nice to see that even in such a relatively small story update, Bioware tried to mix things up with a bit of non-combat action, by having quests that required tasks like using scanners or Macrobinoculars. The quest with the super fast custom speeder in particular was good for a couple of laughs (I catapulted myself off the platform of course). The only slight annoyance was the bonus mission to save civilians at the tower, which felt like a considerable bottleneck as there weren't that many of them around. It wasn't exactly a show-stopper, as you could just skip the bonus, but considering that every other quest, including this bonus one, gave an achievement, I don't think many people liked that idea. It might get better once more players are repeating the whole thing on alts and can skip the bonus without missing out on anything. Achievements in general were a bit silly. Kill a mob - achievement! Complete a quest - achievement! Complete another quest - another achievement! I found it more amusing than annoying though. The questing flow and environment felt a bit weird... unlike on other planets, you don't enter a single large area, but instead you do a couple of quests in a tiny area, then go back up to the space station to be sent to another tiny area, and so on and so forth. It feels very heavily instanced/lobby-like. As someone who quite likes a big open world I always feel like this kind of thing should bother me more, but I think SWTOR gets away with it (in my personal estimation) because it makes sense to have "cuts" when you're travelling between areas on different sides on a planet or between different planets altogether. It just feels a lot less jarring than running into a loading screen while crossing a zone border in a fantasy MMO. Last but not least... the story! I liked it. While it was short enough to play through it in one evening, Bioware still managed to pack it with a couple of twists and turns. It ends without a real resolution, but it's been confirmed that this is intentional and that the "real" ending will be revealed on Star Wars Day (May the 4th). I don't mind waiting another week, though it does increase pressure on the ending to be something that was truly worth waiting for! On a side note, it's funny how many players thought that the quest ending where it did was a bug. I guess 3.0's major blunder with the buggy Revan fight has really hurt people's faith in Bioware's ability to put out content that works as intended. On a final and completely random note: I loved the bit where you fight the two possessed Jedi in the tower and the Sage uses Force Barrier just before you can get him down. It was just like a bad PvP match and made me laugh out loud. Nice overview and honest in content. I am looking forward to seeing it especially after the May opening of the closed parts. For a small content update I think it's pretty solid from your review. I have to agree that erosion of team play on quests is not a good thing. Here is to hoping seeing more interesting content out there. There's definitely something wrong with that civilian bonus. I got a couple simply by standing close, I think, because I ran Ziost ungrouped. I liked the story and am hopeful that the finale will be pretty nice. For me it was the opposite, I missed out on one my pet tank got credit for while we were grouped and he was right next to me (which didn't help things). Oh, and thank for the mostly spoiler free post. I'm only a little ways into Ziost, and my first impression is a combination of Balmorra and Ord Mantell. I'm just happy to hear that you're getting caught up! Yeah, an expac entitled Shadow of Revan kind of gives some things from the original storyline away. Thanks for the review. I got about 2 quests into it on my jugg and took a break. I have been wanting to see ziost since I first did EV on emp side, and am looking forward to seeing where the story goes on ziost. Side note, I read half of your first sentence and thought, you know it's like empire ord mantell, then boom, that's what you said.